Run by Rosario Bavetta, Rosario aims to bring a bit of Sicily to the West Country. This 7-day a week cafe is conveniently situated in Northumberland Place in the city of Bath - one of Bath’s ancient cut-through alleyways between the Guildhall and the main shopping streets. 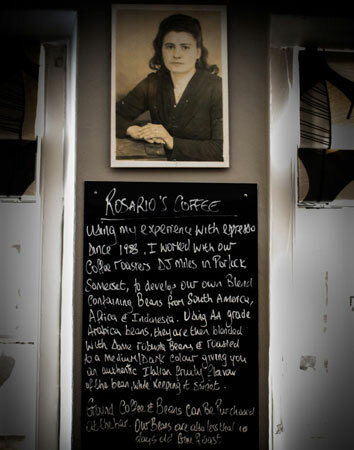 We offer wide selections of top quality breakfasts, lunches, teas, Sicilian cakes and our unique Italian Coffee. We source locally to support local farming industry and use authentic Italian ingredients in food preparation. It's the perfect place to stop for a bite while you enjoy shopping around in Bath's famous small independent shops. Our tea blender and coffee roaster is D J Miles, located in Porlock, Somerset. They work with the Ethical Tea Partnership to ensure its teas are from plantations where ethical standards are monitored, and our coffee beans are sourced from small co-operatives.